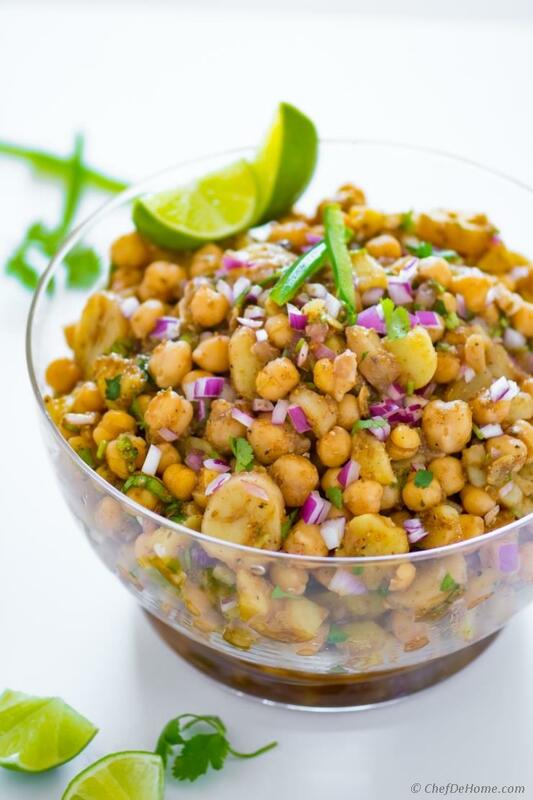 Potato and Chickpea Salad with sweet, sour, and spicy tamarind dressing. 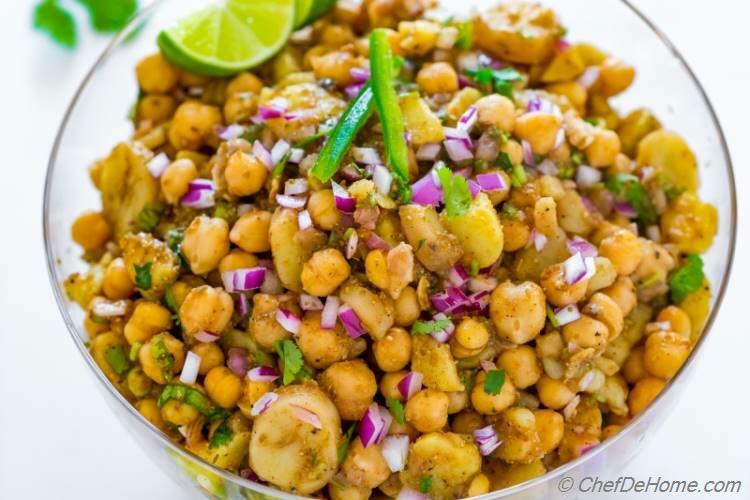 Famous by name of Aloo Chana Chaat or Aloo Chole Chaat, this potato chickpea salad is bursting with flavor of Indian spices and a must try at-least once in life. Ready in just 20 minutes, it is also gluten free, vegan, and loaded with veggie-protein. The best thing about this earthy chickpea salad? 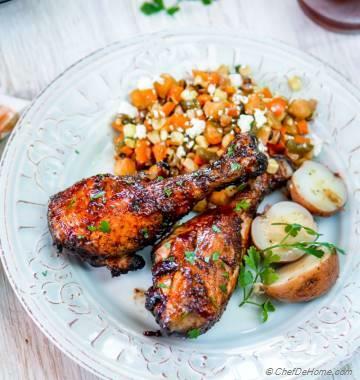 It is more than just a side salad and can be served many ways! As a side salad, complete lunch salad, or a chickpea-potato naan wrap, or an appetizer dip with side of chips. My favorite being a salad, and leftovers as naan wrap topped with crunchy red onions, and splash of lime juice. Scrumptious! 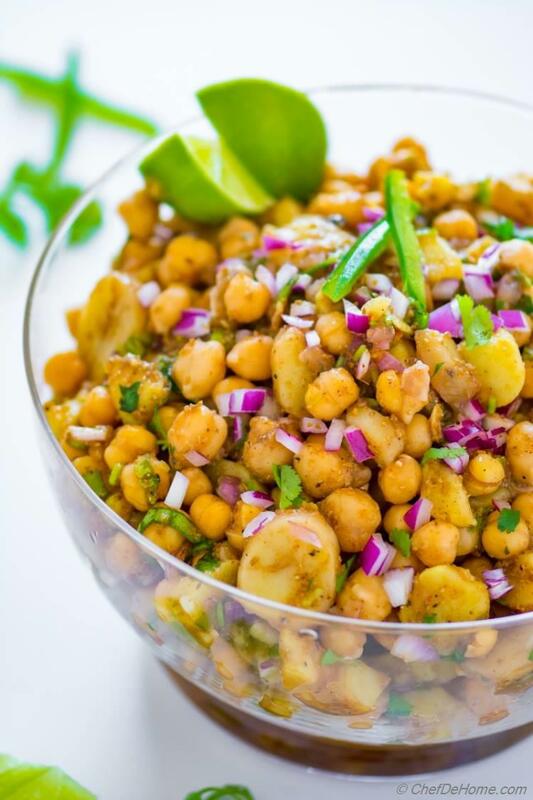 So, let's make some spicy, sweet, tangy, lip-smacking Aloo Chana Chaat?! 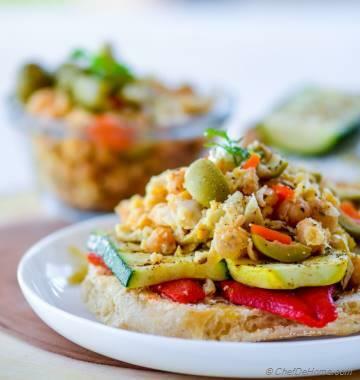 The preparation and base ingredients for this Potato Chickpea salad and even the one sold on streets, are vegetarian, and actually vegan. Honestly, this is one of the main reason, I wanted to bring this salad to you. Often, vegan potato salad or vegan chickpea salads are prepared with dairy alternatives. There is nothing wrong in alternatives. But this salad showcase, how simple ingredients, and spices, without dairy or alternatives, can come together to make a Power Vegan Salad. Plus it has no oil, just a hint of cane-sugar, no gluten.. and still every bite is bursting with flavor. Before I dig deeper into this delicious potato salad... I must share why am I posting after so many days. This, by far, has been my longest break from CDH and I missed you guys SO much!! We recently packed and moved and it has been such a tiring ordeal!! And has not even ended yet! Right now, we just packed and moved. There is still phase of finding the apartment, getting stuff from storage, and then unpacking. Needless to say, I have zero to limited access to my kitchen. But, I have lot of exciting recipes and experiences to share. Please, stay tuned! I'm bringing lots of fun your way as soon as I have access to my kitchen. So, finishing this week easy.. with this delicious and easy gluten free potato salad. Next two weeks, I will be sharing some exciting new summer recipes which I cooked in anticipation of our move. So, check back soon. 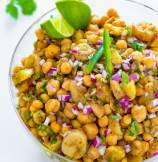 To prepare chickpea salad (aloo chana chaat), I often soak dry chickpeas overnight and cook'em next day. When in hurry, or not pre-planned, I use low-sodium and organic canned chickpeas. If you have access to dried chickpeas, feel free to soak overnight and boil with salted water until tender. Or use good quality canned. Both work fine in this salad. While chickpeas boil, I also boil potatoes. Baby potatoes I leave skin-on and dice in small coin size pieces. If using larger, I peel and rough chop'em. Once potatoes and chickpeas are ready.. I mix-in spices, tamarind, chopped red onion, jalapeno, and cilantro! That's it. A little taste, adjust of seasoning and Potato Chickpea Salad is ready to rock any party or potluck. This salad can be served chilled, or at room temperature. Note: Always make sure to taste and adjust seasoning in this salad. The need for salt, tamarind, or sweetness may vary by taste. Friends, even though absent for few days, I'm glad one more chickpea recipe had made to blog. Remember? I shared, we eat lots of chickpeas in our home!! I try to bring to you some chickpea yummy-ness every month. 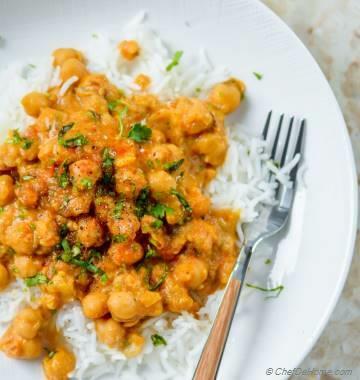 You can find a good size collection of Chickpea Recipes on blog. A lot of which are chickpea salads. Do check it out! Keeping today's post sweet and short. 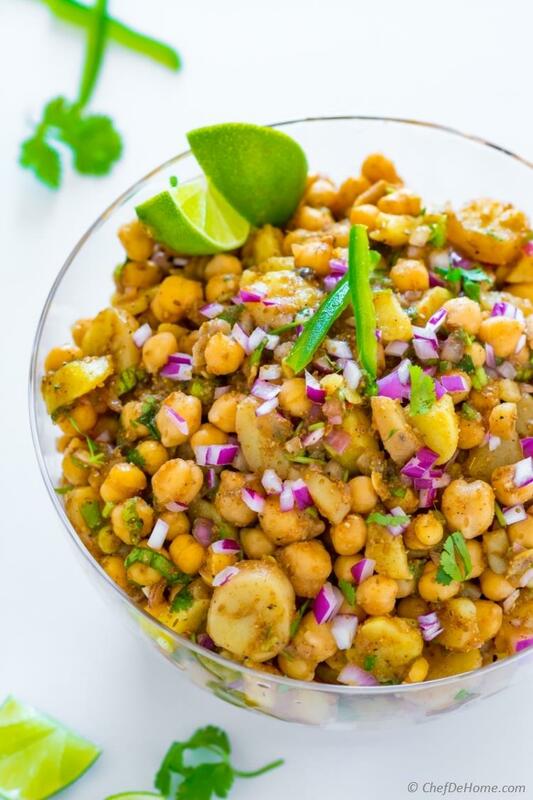 To sum-up this Aloo Chole Chaat a.k.a potato chickpea salad.. It is vegetarian, gluten free, vegan, and healthier with bold flavor of spices. It is not required to add all spices, but if you can, please do. The aroma of spices with tangy-sweet flavor of tamarind dressing is what makes this salad, the best Indian street food ever! Total Time 20 minutes Prep Time 10 minutes Cook Time 10 minutes Difficulty Easy Yields serves a crowd Serves 8 Notes Recipe time does not include chickpea cooking time. 1. Boil potatoes until knife tender. When slightly cool, peel and dice. Mix tamarind paste with sugar and hot water until fully dissolved and set aside. 2. In a salad bowl, add cooked chickpeas (rinsed if using canned) and boiled diced potatoes. Add 3/4 cup of diced red onion, jalapeno ( green chili), and half of chopped cilantro (coriander) leaves. 3. Top with all spices, salt, lemon juice and 4-5 tablespoons of tamarind mixture. Mix well. **Taste and adjust salt, tamarind, and chili powder. Garnish with remaining chopped red onion and cilantro leaves. *Refrigerate until ready to serve. *This Chickpea Potato salad can be served chilled, or at room temperature. **Always make sure to taste and adjust seasoning in this salad. The need for salt, tamarind, or sweetness may vary by taste.